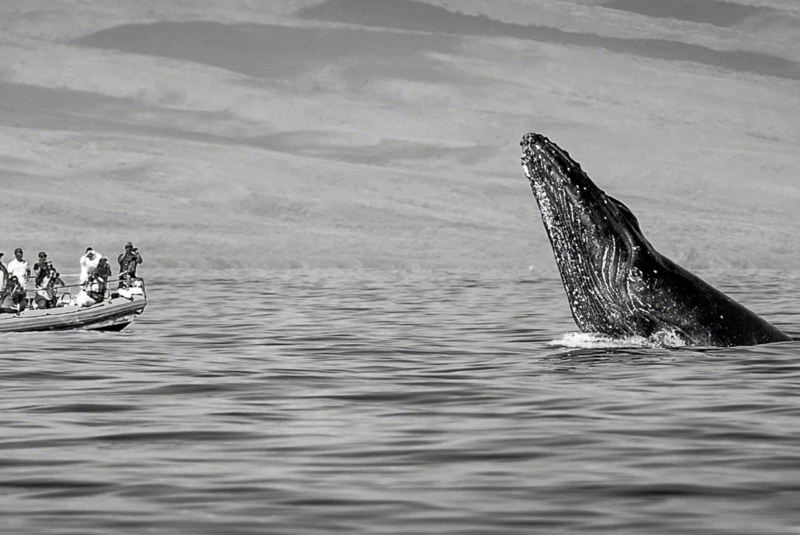 While some migratory sharks and turtle species are of cultural importance to peoples of Pacific Island Nations, migratory humpback whales fuel the whale watching industry in many Caribbean States, and migratory fish, such as Atlantic bluefin tuna, have been a pillar of Mediterranean fisheries for centuries. Understanding how these species use areas beyond national jurisdiction (ABNJ) is essential for their transboundary conservation and management, which will in turn, preserve some of these socioeconomic, cultural and ecological relationships with coastal States around the world. It has become clear that there is a major knowledge gap on marine migratory connectivity on the high seas that can be provided by the many marine spatial planning initiatives involving areas beyond national jurisdiction (ABNJ). The Marine Geospatial Ecology Lab of Duke University is leading a consortium to develop The Migratory Connectivity in the Ocean (MiCO) system to fill this knowledge gap. MiCO is part of a larger grant to the Global Ocean Biodiversity Initiative from the German International Climate Initiative to inform area-based management in the high seas. MiCO seeks to compile and, where necessary, synthesize scaled-up knowledge on migratory connectivity for species utilizing areas beyond national jurisdictions. MiCO will convey information on connectivity among “nodes” (aggregations of areas used for a particular life cycle activities) and via “corridors” (aggregations of paths animals travel between nodes). Data from a wide array of sources including telemetry, mark/recapture, stable isotope, genetic, and acoustic sampling are being gathered from direct contributions by collaborating partners and a systematic literature review. The literature review encompasses over 200 species listed in the Convention on Migratory Species or managed by a Regional Fisheries Management Organization and the complete system will address nearly 1000 migratory species across the four taxa. Over 50% of the species in the literature review are listed as Near Threatened, Vulnerable, Endangered, or Critically Endangered by the IUCN, including 20 listed as Endangered and 13 as Critically Endangered. The body of knowledge that will be generated through the MiCO system will be open access, thus leveling the playing field for States and non-State actors who wish to engage in the conservation and management of marine migratory species; both within and beyond national jurisdictions. 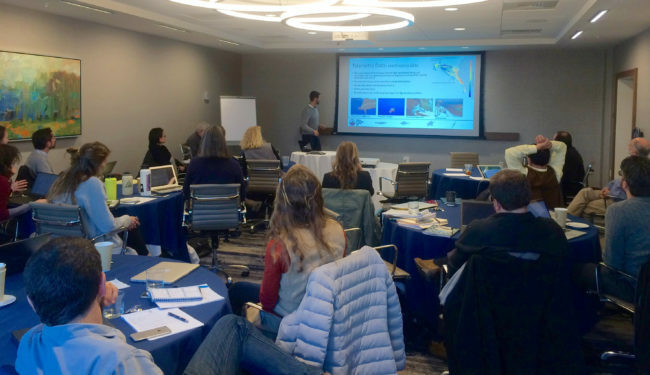 During the last year, the MiCO team at Duke University has expanded its internal team through the recruitment of graduate students from Duke’s School of the Environment, has hosted a strategic kick-off meeting for all MiCO partners and built the foundations of the MiCO website and online interactive tool, where all the spatial information on marine animal migrations will be held. Throughout the next six months, MiCO researchers at the Marine Geospatial Ecology Lab will give oral presentations at various international meetings and continue reaching out to the community of researchers whose work focuses on marine movement or migration ecology to discuss potential collaborations. As MiCO aggregates knowledge on areas of ecological importance for marine migratory taxa, and the connectivity between these, researchers and governments will be able to identify taxonomic and spatial biases and gaps in the information available on the spatiotemporal distribution of marine migratory species; thus, allowing for more targeted research to fill existing gaps in knowledge. Nereus Program Fellow at Duke University Guillermo Ortuño Crespo presents at a MiCO workshop. As part of my Ph.D. at Duke University, I am leading the efforts for the fish taxonomic group; this means that I hold the responsibility to manage the process of aggregating spatiotemporal knowledge on the distribution of all migratory fish species. I am primarily interested in the main catch and bycatch fish species in international fisheries, including several tuna species, swordfish and oceanic sharks. In the literature review stage, we identified about 3,000 papers on 71 fish species which, together with other graduate students at the Nicholas School of the Environment at Duke, I will classify and ready over the next 18 months. As a Nereus partner, the Marine Geospatial Ecology Lab will strive to cultivate collaborations with other Nereus institutions on the topic of area-based management of species in the high seas. Throughout 2016 and 2017, in compliance with the United Nations (UN) General Assembly resolution 69/292, the UN Preparatory Committee met for the development of the elements of a draft text of an international legally binding instrument on the conservation and sustainable use of marine biodiversity of areas beyond national jurisdiction. States throughout the world, from Pacific Island States to coastal Caribbean nations, showed particular interest in accessing information on the transboundary movements of marine migratory species between States and into the high seas. Over the next few years, the MiCO system will generate and distribute this new body of spatial knowledge on migratory species, which may become particularly useful for the establishment of area-based management measures by the UN in the high seas. Understanding, preserving and managing the transboundary connectivity of many of these species does not only have ecological implications, but also socioeconomic and cultural ramifications for coastal communities worldwide. Guillermo Ortuño Crespo is a Ph.D. student at Duke University’s Marine Geospatial Ecology Lab. He recently obtained a M.Sc. degree in Ecosystem-based Management of Marine Systems from the University of St Andrews, where his research was focused on the conservation and management of Thunnus thynnus and the use of genetic tools in fisheries management. His main research interests are in the spatial ecology and conservation of highly migratory, straddling species, which raise fundamental questions about their trans-boundary management, particularly in areas beyond national jurisdiction.